Gulluk Mountain (Güllük Dağı) Termessos National Park is located within the province of Antalya in a valley between mountains. There is the ancient fortified city of Termessos rising 1050 m above the sea level. 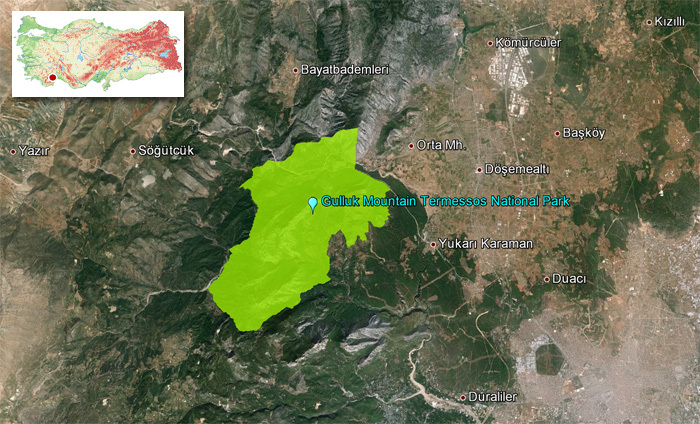 Gulluk Mountain Termessos National Park can be reached via the Antalya – Korkuteli highway. The National Park is in 34 km northwest of Antalya, in the Taurus mountains in the Korkuteli district. The ancient city of Termessos was found by the Solims who lived in the Psidia Region. Although there are nofacts available about Termessos and Solims, they are natured by Homer in the Iliad in connection with the legend of Bellerophon. The most significant remains of the site are the city walls, Towers, King’s Road, Hadrian’s Gate, Gymnasium, Agora, Theatre, Odeon, Richly, Decorated Tombs, cisterns and drainage system. Other features of the Natural Park are the step rocks of Gulluk Mountain (Güllük Dağı) and the Mecine Canyon with its 600 m high walls along with the typical Mediterranean vegetation sheltering such endangered wild creatures as mountain goats, fallow deer and golden eagle. Termessos is one of the best preserved of the ancient cities of Turkey. The city of Termessos is split into three areas; downtown, city centre and the cemetery. Its best years were during the Roman Empire, and its best remains are the city walls, King’s road, Harian’s Gate, gymnasium, theatre, Odeon, decorated walls and cisterns. The Visitor’s Centre at the park entrance has detailed information about the area. There are areas for tents and caravans, and a good selection of restaurants and buffets. Geomorphologic beauties in Gulluk Mountain Termessos National Park include the steep rocks of Gulluk Mountain, and Mecine Canyon which has walls about 600 meters high. The forests and variety of plants are typical examples of the Mediterranean. There are very rare species of wildlife living in the area. The best time to visit the area is between April and December. According to Turkey’s Ministry of Culture and Tourism, Gulluk Mountain Termessos National Park has an area for tents and caravans as well as some restaurants. A visitor’s center at the National Park entrance has detailed information about the area. Termessos (also known as Termessus) was inhabited by the Pisidians, an indigenous Anatolian nation of noted ferocity. The city first appears in history during the conquests of Alexander the Great. Alexander swept through the region but after winning a skirmish in the narrow mountain passes near the city, declined to storm it. (Guidebooks consistently portray Alexander as unable to take the city, but in fact he was merely disinclined to try.) After Alexander’s death the city saw a famous clash during the wars of Alexander’s “Successors.” One of Alexander’s generals, Alcetas, found himself trapped in the city by another of Alexander’s generals, Antigonus the “One-Eyed.” Beloved by the city’s young people, Alcetas was betrayed by its “senior citizens” and comitted suicide rather than fall into Antigonus’ hands. Mutilated and left unburied by Antigonus, Alceta’s body was retrieved by the younger generation and given a hero’s burial. The extant “lion sarcophagus” has convincingly been identified as his final resting place—among the only surviving graves of Alexander’s friends and companions. In the Hellenistic period, Termessos gradually “Hellenized,” adapting Greek culture, language and even becoming a democracy. The impressive theatre was built during this period, no doubt serving as both entertainment venue and political meeting place. Throughout the period, Termessos was engaged in frequent warfare with its neighbors, often taking on more than one. For its help in his campaign against Selge (c. 158 BC), Attalus II of Pergamum erected the city’s elegant stoa (porch). Termessos passed easily into Roman friendship and later empire. The city received considerable autonomy for its role against King Mithridates. It guarded its privileges jealously; remarkably, its coinage never included either image or title of the Emperors. (This is the source of the tour-guide story that Termessos was never conquered by Alexander or the Romans) Most of the city’s buildings were erected in this period, including a temple to the Emperor Hadrian. 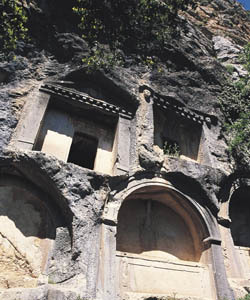 At some point the city Christianized, and bishops from Termessos participated in the early church councils, but the city was abandoned between the V–VII centuries. Except for the occasional nomad it lay empty after that, which explains its relatively pristine state. Antalya: with a history dating back to 133 BC and a name meaning “Home of Attalos” referring to the founder of the city Attalos, is a peaceful city situated at the slopes of the Taurus Mountains rich in scenic beauties and historical monuments. Antalya which can be visited any season, is an indispensable touristic destination particularly during the summer. This “blue” city enchants its guests with its beautiful beaches and has the longest coastline in Turkey.